This Naxos collection includes recordings Berger made, mostly in Germany, between 1934 and 1949. Only three tracks are duplicated from a rival EMI collection released in 1990 (CDM 7 63759 2), making this new Naxos CD good value for Berger fanciers. (The EMI disc covers a later period in the soprano's career, all the way up to 1959.) Given the time and the circumstances, it is not unusual that everything is sung in German… everything, that is, except a rare aria from Weber's Ines de Castro. The Italian arias hold up better than the French; it is very odd hearing "Comme autrefois" from Bizet's The Pearl Fishers sung in German! Berger had a rare gift. Unlike many coloratura sopranos, her singing never seemed mechanical, like that of a wind-up nightingale. And, while she never failed to imbue the music with brilliance – when brilliance was required – the winning warmth of her voice remained a constant. Her version of Gilda's "Caro nome" (here, "Teurer Name, dessen Klang"!) could teach many an Italian soprano a thing or two. Rapt and girlish (but not juvenile), Berger captures both Gilda's innocence and the sincerity of her growing love for her "Gaultier Maldé." Another gift is the quality of the orchestral collaboration that Berger received. The conductors on this recording include names such as Sir Thomas Beecham, Josef Krips, Leo Blech, and Hans Schmidt-Isserstedt, and the orchestras include the Philharmonia and the London Philharmonic. 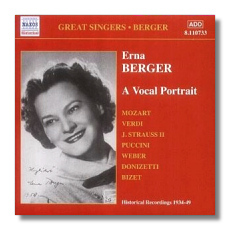 It is clear that Berger was a highly esteemed singer, and recording companies (here, Telefunken, HMV, and Polydor) treated her with the respect that was due. This CD's transfers from 78-rpm shellac discs have been done by Ward Marston. In general, the sound is startlingly alive, although surface noise sometimes is more audible than one expects from this source.